Give the gift of delicious raw chocolate. 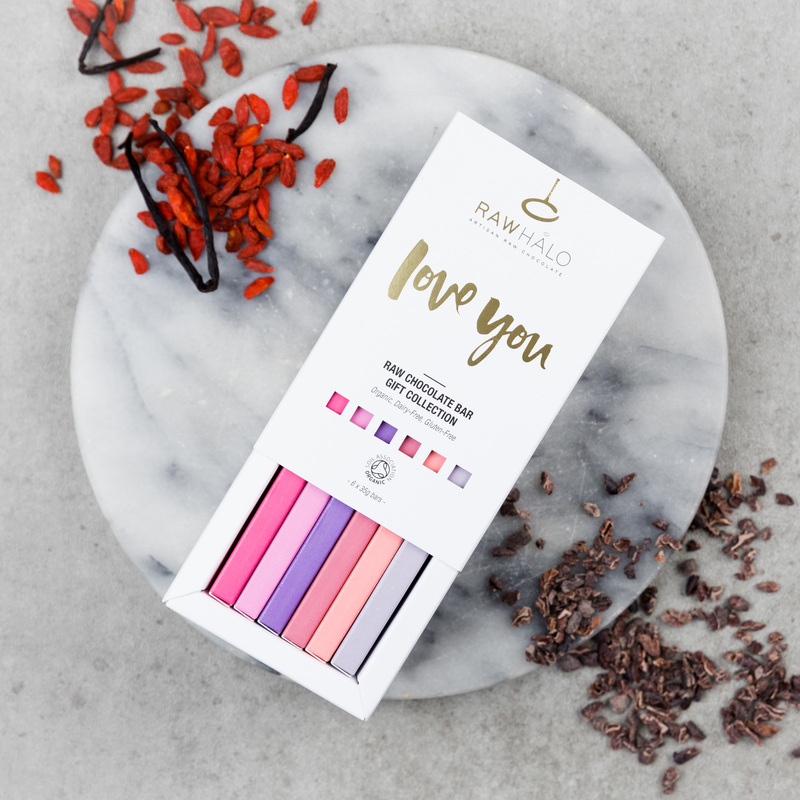 A healthier way to enjoy chocolate, smooth and fruity peruvian raw cacao is sweetened with organic coconut sugar - ensuring each bar is glowing with goodness. 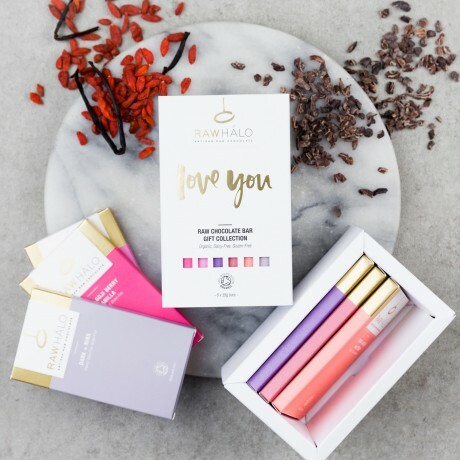 A delicately gold embossed Love You themed gift box contains 6 x 35g bars of award winning chocolate, which is organic, raw, vegan friendly, gluten free and containing no refined sugar. Shelf life of 6 months. Store in a cool, dry place. Pure Mylk 35g Bar Raw cacao butter*, coconut sugar*, raw cacao powder*, cashew nuts*, lucuma powder*, inulin powder*. *Certified organic ingredients. Cocoa solids 57%. Mylk + Pink Himalayan Salt 35g Bar Raw cacao butter*, coconut sugar*, raw cacao powder*, cashew nuts*, lucuma powder*, inulin powder*, pink Himalayan salt (0.6%). *Certified organic ingredients. Cocoa solids 57%. Mylk + Goji Berry and Vanilla 35g Bar Raw cacao butter*, coconut sugar*, raw cacao powder*, cashew nuts*, lucuma powder*, goji berries* (5%), inulin powder*, pure vanilla extract* (0.1%). *Certified organic ingredients. Cocoa solids 54% minimum. 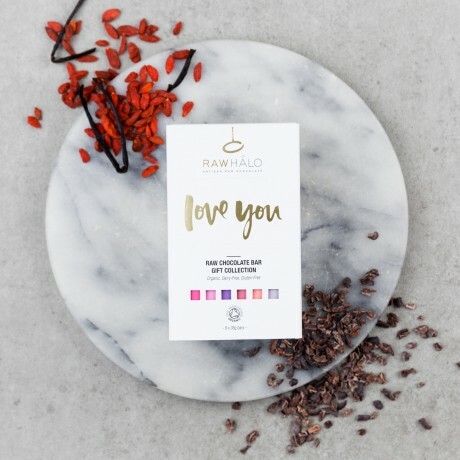 Mylk + Cinnamon and Raisin 35g Bar Raw cacao butter*, coconut sugar*, raw cacao powder*, cashew nuts*, lucuma powder*, raisins* (9%, includes sunflower oil), inulin powder*, pure cinnamon extract* (0.1%). *Certified organic ingredients. Cocoa solids 54% minimum. Dark + Ginger and Pecan 35g Bar Raw cacao butter*, raw cacao powder*, coconut sugar*, pecan nuts* (9%), ginger essential oil* (0.1%). *Certified organic ingredients. Cocoa solids 69%. Dark + Nibs 35g Bar Raw cacao butter*, raw cacao powder*, coconut sugar*, raw cacao nibs* (12%). *Certified organic ingredients. Cocoa solids 79% minimum. Not suitable for nut and peanut allergy sufferers due to manufacturing methods. Pure Mylk 35g Bar Typical Values Per 100g: Energy 2419kJ / 585kcal, Fat 46.9g, of which saturates 28.0g, Carbohydrate 35.9g, of which sugars 22.6g, Protein 6.5g, Salt 0.2g. Mylk + Pink Himalayan Salt 35g Bar Typical Values Per 100g: Energy 2419kJ / 585kcal, Fat 46.9g, of which saturates 28.0g, Carbohydrate 35.9g, of which sugars 22.6g, Protein 6.5g, Salt 0.7g. Mylk + Goji Berry and Vanilla 35g Bar Typical Values Per 100g: Energy 2373kJ / 574kcal, Fat 45.0g, of which saturates 26.8g, Carbohydrate 36.9g, of which sugars 23.9g, Protein 6.8g, Salt 0.2g. Mylk + Cinnamon and Raisin 35g Bar Typical Values Per 100g: Energy 2325kJ / 562kcal, Fat 43.1g, of which saturates 25.8g, Carbohydrate 38.8g, of which sugars 26.9g, Protein 6.2g, Salt 0.2g. Dark + Ginger and Pecan 35g Bar Typical Values Per 100g: Energy 2376kJ / 574kcal, Fat 46.2g, of which saturates 26.3g, Carbohydrate 30.2g, of which sugars 20.1g, Protein 9.7g, Salt 0.2g. Dark + Nibs 35g Bar Typical Values Per 100g: Energy 2354kJ / 568kcal, Fat 44.7g, of which saturates 29.0g, Carbohydrate 30.7g, of which sugars 19.1g, Protein 10.2g, Salt 0.2g. This product is dispatched by Raw Halo. This item has a shipping weight of 210g.